Sevierville was founded in 1794, however it was an important Native American community before settlement by pioneers. Several archeological sites are found in Sevierville, including a large burial mound on the banks of the Little Pigeon River just off of the Forks of the River Parkway. In 1881, items found at this site during an archeological survey were sent to the Smithsonian Institution in Washington, D.C. 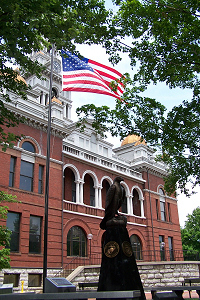 The artifacts date to 1200-1500 A.D., while nearby sites reveal villages of the Woodland Indians from 200 A.D.. Sevierville's distinctive courthouse was constructed in 1895.